London Design Festival 09: new British design and production company Very Good & Proper launched their first collection at The Dock in London last month. Called Canteen, the collection includes a chair, table and coat hook. The pressed beech plywood seat of the chair is supported by a powder-coated steel frame. The aluminium table legs attach directly to the underside of the top and are also supplied separately for use with an existing or found top. A powder-coated plate behind the knob of the coat hook forms a secondary hook and protects the wall behind from scratches. Very Good & Proper is a collaboration between London designers Klauser & Carpenter and restaurateur Patrick Clayton-Malone. The Canteen collection was originally designed Canteen restaurant in Baker Street, London, co-founded by Clayton-Malone. Very Good & Proper is a collaboration between Canteen co-founder Patrick Clayton-Malone and design duo Klauser & Carpenter; set up to produce well designed, practical, reasonable priced products originated by emerging and recognised design talent with longevity in mind. The exhibition will see official launch of VG&P, featuring the Canteen Table, Canteen Hook & Knob and the Canteen Utility Chair. A commercially feasible table with design integrity suitable for residential or commercial applications. The tabletop is available in a range of sizes in beech plywood. Ready to attach to any tabletop or even old door. Available in boxed sets of four in a range of snazzy colours. Gravity cast aluminium leg fixes directly to the tabletop eliminating the need for a bracing system. Canteen hook and knob. The powder coated steel backplate and hook protects the wall from dirt and scratches, covering any unsightly fixing marks; the knob, large, round and simple to locate. 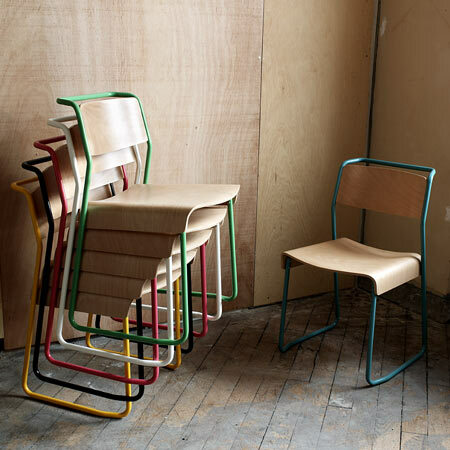 Inspired by the ubiquitous post war school chair. Powder coated steel frame married to a pressed beech plywood seat and back. Lightweight and stackable.